﻿ Best Price on Montana de Fuego Resort & Spa in La Fortuna + Reviews! Offering great views of Arenal Volcano, 5 mi away, Montana de Fuego Resort & Spa features luxurious accommodations set among attractive gardens and lakes. This striking property has indoor and outdoor swimming pools, kids pool and its own adventure park. Free WiFi is available at the Lobby and Restaurant. This bungalow style resort offers contemporary suites and bungalows with stylish décor, sloping, thatched roofs, beamed ceilings and floor-to-ceiling windows. Each has a balcony or terrace, air conditioning, a mini-bar and a bathroom. Luxury amenities are included. You can enjoy Costa Rican cuisine in the Acuarelas Restaurant, which uses produce grown in the property’s orchard. Buffet breakfast is included. The Fuego’s park offers activities including rainforest canopy tours, kayaking, rafting and horse riding. Guests can enjoy Thermal Springs and volcanic mud baths. 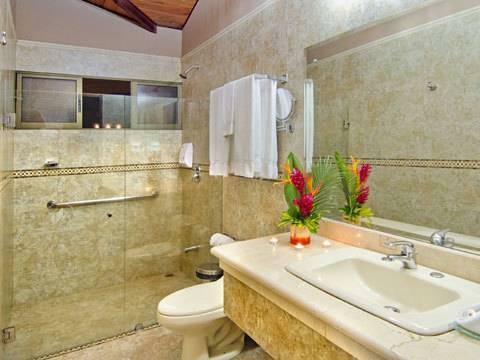 Montana de Fuego Resort & Spa has indoor and outdoor hot tubs, sauna and spa and 24 hours medical service. Arenal Lake is a 15-minute drive away, while San José is approximately 75 mi from the Montana de Fuego Resort & Spa.